Commercial property is a core asset class among institutional investors and family offices, favoured for a strong income return and providing a hedge against more volatile equities. The principal sectors are retail, office and industrial, with alternatives attracting a growing share of investment in recent years as technology drives change in the way we live, work and shop and the demographic balance of the population evolves. Read more about commercial property as an asset class here. Commercial property is less management intensive than residential and PBSA, with the tenant taking responsibility for the upkeep of the building and refurbishment. This agreement is typically formalised with a full repairing and insuring lease (FRI). Asset management is required to ensure tenants are keeping up their terms of the lease and at key stages during the investment cycle when a lease needs to be re-negotiated or a property repositioned. We believe commercial property offers a complimentary return profile to residential, with total return driven by long-term income and the strength of the lease in place with a tenant. We aim to deliver a robust total return based primarily on income, with strong prospects for capital growth based on rental value growth with long term leases. We intend to offer two categories of investment with different performance profiles based on the level of risk involved and the return expected; “Passive long-income” and “Active income”. Passive long income – Typical dividend yield 4.5% + p.a. Prime, low risk investments let to a household name business with a long, unexpired lease term. Such commercial property investments are often likened to fixed income investments such as bonds, with the benefit of guaranteed rental increases and protection against inflation. Please note: Past performance is not a reliable indicator of future performance. Active income – Typical dividend yield 5.0% + p.a. Similar property and tenant types to long-income but with one or more weaknesses in the lease which impact the value of property and increase the yield. Under this strategy we choose to accept an additional element of risk in the belief that our active management can enhance the value of the proposition, for example, through negotiating an extension to the tenant’s lease. -Confidence in being able to let the unit to an alternative tenant, or re-positioning the building cost-effectively, should the property become vacant at the end of the lease. A wide variety of property sectors and uses fall under the banner of commercial property, each with different characteristics and risk profiles as an investment. It’s vital to understand the market and base selections on performance requirements and appetite for risk, which can mean that the underlying building type is of secondary importance to the lease in place and the covenant of the tenant. 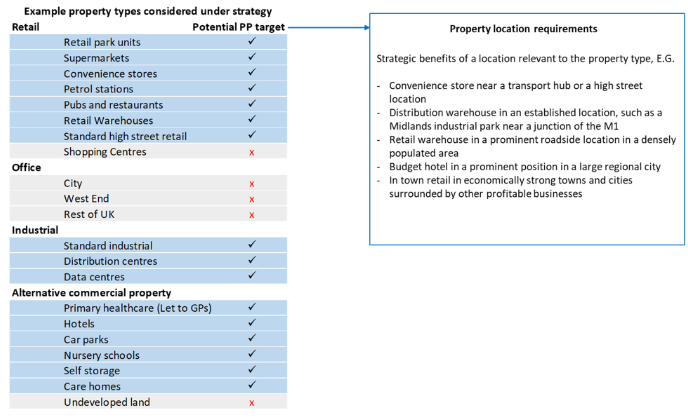 See a list of example property types below and those which we believe are suitable to deliver the objectives of our strategy. Location is of paramount importance across property investment. In commercial property, the quality of a location depends on the strategic requirements of the type of business occupying the premises. We use our expert knowledge, gained through decades of property investment experience, to rigorously appraise properties and minimise risk. Every property we acquire is visited by a member of our property team, who carries out a full assessment of its physical attributes and its appeal to customers of the occupying business, as well as to potential alternative tenants. In addition, our team of analysts assess the strength of the local rental market and letting track-record of nearby properties, with the benefit of access to leading industry intelligence. Before acquiring a property our in-house property legal team conduct searches to ensure there are no hidden complications concerning leases, covenants or charges held against the property. Put simply, buying property is our day job and we believe we add significant value for investors through our comprehensive process of appraisal and due diligence. Final approval to purchase is given by the investment committee, which includes the Director of Property, the CEO and the CFO. The panel determine whether our required levels of quality and the minimum performance criteria are met. From the point of receiving the green light from the investment committee, a property can be launched on platform within a week. Read more about commercial property and investing with Property Partner here. Subscribe to our monthly newsletter to access property market updates, Property Partner related news, and to hear about new investment opportunities. Important notice: Capital at risk. The value of your investment can go down as well as up. The Financial Services Compensation Scheme (FSCS) protects the cash held in your Property Partner account, however the investments that you make through Property Partner are not protected by the FSCS in the event that you do not receive back the amount that you have invested. Forecasts are not a reliable indicator of future performance. Gross rent, dividends and capital growth may be lower than estimated. 5 yearly exit protection or exit on platform subject to price & demand. Property Partner does not provide tax or investment advice and any general information is provided to help you make your own informed decisions. Customers are advised to obtain appropriate tax or investment advice where necessary. Before investing please read Key Risks. Past performance is not a reliable indicator of future performance. Financial promotion by London House Exchange Limited (8820870); authorised and regulated by the Financial Conduct Authority (No. 613499).